Tribulus terrestris is an herbal nutritional supplement that is promoted to produce large gains in strength and lean muscle mass in 5-28 days. However, current evidence suggests that it does not enhance sports performance. Tribulus terrestris became widely known when Bulgarian Olympic athletes (weightlifters) claimed that use of tribulus had contributed to their success. Can Tribulus terrestris Improve Workout? Tribulus terrestris is added to sport supplements in an attempt to enhance athletic performance. In 8-week study Jose, et al. reported increased leg press by about 3% with 3.12 mg/day of tribulus, while placebo group increased bench press repetitions. Study concluded that supplementation with tribulus does not enhance body composition nor does it increase exercise performance in bodybuilders. In 6 weeks, twenty-two elite rugby players significantly increased their 2 RM without changes between placebo and tribulus group . 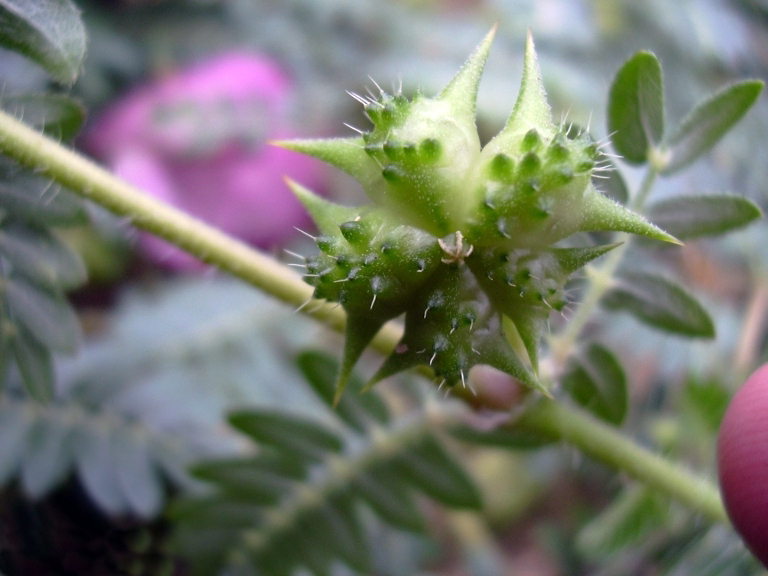 There are a few studies that show benefits for athletic performance from Tribulus terrestris ingestion but many other studies are not as promising . Marketers claim that tribulus can enhance testosterone production via the stimulation of luteinizing hormone from the pituitary gland. A study from Medical University in Sofia  wanted to investigate if Tribulus terrestris extract has effect on androgen metabolism. Twenty-one healthy young men (20-36 years old) were separated into three groups – two experimental (each n = 7) and a placebo one (n = 7). The experimental groups were named TT1 and TT2 and for four weeks subjects were assigned to consumed 20 and 10 mg/kg body weight per day of Tribulus terrestris extract. Levels of testosterone, androstenedione and luteinizing hormone were measured. There was no significant difference between Tribulus terrestris supplemented groups and placebo in the serum testosterone, androstenedione and/or luteinizing hormone levels. The study concluded that Tribulus terrestris possess neither direct nor indirect androgen-increasing properties. Another five-week study  was performed on twenty-two elite rugby league players who were given 450 mg/day of Tribulut Terestris extract or a placebo. No between-group differences were noted in urinary testosterone/epitestosterone ratio were monitored prior to and after supplementation . Brown and associates  conducted a very interesting study where 10 subjects received placebo and other 10 received a combined herbal extracts designed to enhance testosterone formation (ANDRO-6). Daily doses of ANDRO-6 contained 300 mg androstenedione, 150 mg DHEA, 750 mg Tribulus terrestris, 625 mg Chrysin, 300 mg Indole-3-carbinol, and 540 mg Saw palmetto. Even with such rich array of herbal extracts serum free and total testosterone concentrations remained unchanged. There is one study in rams where Tibestan (a preparation with T. terrestris) increased testosterone levels and reversed sexual impotence , however no such studies exist in humans. 6 weeks of tribulus supplementation in elite athletes failed to improve over placebo in body mass as well as fat-free mass. Some companies claim that T. terrestris should be supplemented with a high-protein diet to maximize its anabolic potential. In previously mentioned study, subjects consumed on average 2.7 g/kg/day of protein. So, the insufficient protein intake was not the case for ineffectiveness of T. terrestris. In fact, no independent study [2,4,6] has provided support for the claim that T. terrestris provides increases in strength or muscle mass. Taking tribulus as a supplement for a short time is probably safe . Common side effects include trouble sleeping and irregular periods . Pregnant women should stay away from this supplement as animal studies show problems in fetal development . Neychev, Vladimir Kostadinov, and Vanyo Ivano Mitev. “The aphrodisiac herb T terrestris does not influence the androgen production in young men.” Journal of Ethnopharmacology 101.1 (2005): 319-323. Rogerson, Shane, et al. “The effect of 5 weeks Tribulus terrestris supplementation on muscle strength and body compostition during pre-season training in elite league players.” The Journal of Strength and Conditioning Research 21.2 (2007): 348-352. Antonio, Jose, et al. “The effects of T terrestris on body composition and exercise performance in resistance-trained males.” International journal of sport nutrition and exercise metabolism 10.2 (2000): 208-215. Dimitrov, M., P. Georgiev, and S. Vitanov. “Use of tribestan on rams with sexual disorders.” Veterinarno-meditsinski nauki 24.5 (1986): 102-110. Brown GA, et al. “Effects of anabolic precursors on serum testosterone concentrations and adaptations to resistance training in young men.” Int J Sport Nutr Exerc Metab 10.3 (2000): 340-59.